The towns of Cottage Grove ("Covered Bridge Capital of the West") and Lowell are natural starting places to begin a covered bridge tour. Cottage Grove is home to one of Oregon&apos;s first official scenic bikeways, the "Covered Bridges Scenic Bikeway," which offers 36 miles (57.94 km) of paved bike path looping through town and around Dorena Reservoir to six bridges. Lowell has the Lowell Bridge Interpretive Center with scenic picnic facilities and four additional bridges within a ten minute radius. Whether you decide to drive through, picnic beside, or sit on the riverbank and dangle your toes in the refreshing waters beneath, exploring the region&apos;s nostalgic and romantic covered bridges is the perfect excuse to take a break from the fast lane. 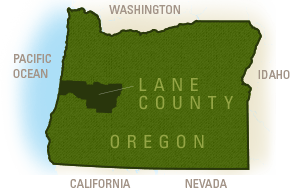 Lane County is home to 20 covered bridges dating back as early as 1920; many are listed on the National Register of Historic Places. Fourteen are still open to vehicle traffic! With more remaining covered bridges than any other place on the West Coast, Oregon&apos;s landmark bridges offer history buffs, photographers and sightseers a look at a well-preserved past in the beautiful setting of the Pacific Northwest. Oregon&apos;s first covered bridges were constructed in the mid-1800s as pioneers settled the region. The bridges were built from wood as it was plentiful. To avoid hauling the lumber, it was often felled nearby and the boards hand-hewn on-site. Roofs helped delay weather&apos;s toll on the wooden supports and planks. The early bridges were often financed by tolls imposed by the bridge owners. By the 20s and 30s, decay started to claim the original structures so local communities worked together to replace them. Just like the first bridges, these second generation covered bridges were regarded as important lifelines to medical care, children&apos;s schooling, mail and commerce. Over time new roads bypassed the former routes and modern concrete and steel bridges replaced wooden spans. Oregon&apos;s many covered bridges fell into disrepair and neglect. One by one they started closing to traffic. However, these romantic landmarks still stirred the hearts of the locals and their historic value was recognized. In 1989 the Oregon Covered Bridge Program was developed to preserve Oregon&apos;s remaining covered bridges. Then again in 2005, Lane County Public Works issued 17 commemorative coins honoring the region&apos;s historic covered bridges. The coin sales generated funds to help maintain the bridges. 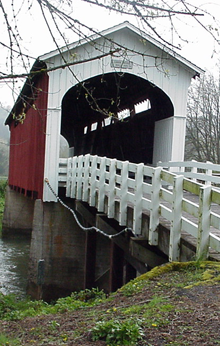 Today, Oregon has a sizable legacy of covered bridges still open for pedestrian, cycling or vehicle traffic. Most of the region&apos;s covered bridges are built with a "Howe truss" design. Originally created for the long span of a church roof in 1840 by William Howe, the structure adapted well to bridges and was used prolifically until the 1920s. The main design feature is diagonal compression timbers slanting toward the center of the bridge. Combined with vertical tension members, the result is an "A"-shaped triangle pattern between the lower and upper chords.